Interesting they went all the way to 29.5". That's like a 75cm mast. Watch out for the bottom in a lot of breaks. I find I skim (hit) the bottom quite a bit on the 70cm. Actually really like 62-65cm as for where waves are catchable, you don't hit as often. They will be good for DW though. Yeah I thought the same , it's super long and probably more for DW than surfing . I personally like 650 for waves 700 is ok too but like you said especially on prone boards it hits the bottom a lot just paddling around on the beaches and hits more on duck dives. Good to see that they have made the mast stiffer & stronger as well that was the only thing I didn't like about GF . I was under the impression that you could only buy Gofoil in a set (mast/wing set combined)? Yep, definitely far less hits on the SUP. Prone is a different story. I find quite a few locations I end up having to stay laying down as sitting up gets me too deep with the 70cm. And yes, hardly ever have an issue with SUP. 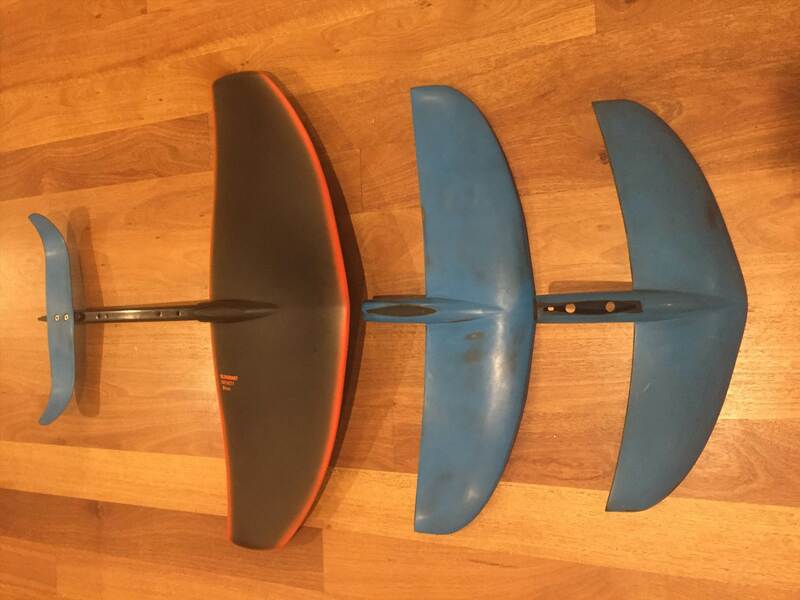 Thanks to Jimmy Lewis boards who brought in a few longer masts by themselves and I was lucky enough to get one without upgrading my whole foil wing set too. The mast Tuttle needed a slight sand to fit and my Kai tail wing fitted perfectly. The Iwa is a little loose fixed temporarily by some aluminium tape. The mast is very stiff and it appears the the mast to fuselage connection is beefed up to stop the slight flexing of the shorter mast. As an average foiler I was prone to often breaching the from wing - that just doesn't happen now. Turning tightly is easy too. I'm definitely sticking with the longer mast now. Uh oh. That means I need to find a different summertime foil brand. That's a shame. 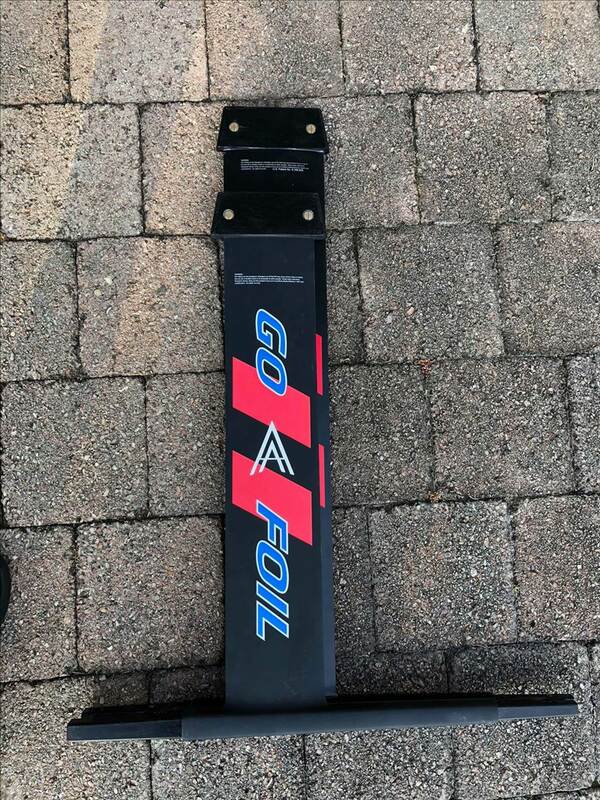 Because my GoFoil Maliko 200 with a 24.5-inch mast gets 90% of my foiling time in the summer. With the old GoFoil masts, I could get about 40 minutes of foiling on either side of low tide. With the new ones, I would have about 10 minutes of useable foiling time either side of low tide. At dead low tide, the tide is too low to foil. The foil hits bottom, even when flying. With my 24" mast, I can start foiling at about 30 minutes after low tide. Then about 1:10 after low tide, it's too deep -- the waves aren't breaking any more. 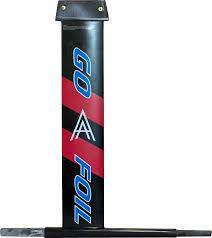 A 29" mast on big foils means no foiling on GoFoil in the Florida summertime. Thanks to Jimmy Lewis boards who brought in a few longer masts by themselves and I was lucky enough to get one without upgrading my whole foil wing set too. . . It looks like they just lengthened the chord. There is more material forward to back on the mast from the view of the Tuttle base down this is clear. Is it also thicker? Heavier? Either way it should be 1) Stronger and 2) Heavier. I love the idea of less breaching and harder turns but there has to be a better way than spending another $1,800 US for my next IWA and Maliko 200. PS: I will rarely fly the Kai wing now. And since I have been experimenting with NO Tail wings and hearing about the advantages of smaller tail wings I am not convinced that you can take bigger wings into bigger surf. BigSeppo - I hear you on the longer mast but just stay short! My sentiments above also reflect yours on just riding a bigger wing. The Kai is like trying to ride a 6' shortboard. The Iwa a funboard and the Maliko 200 a longboard. You'll just have more fun riding waves. 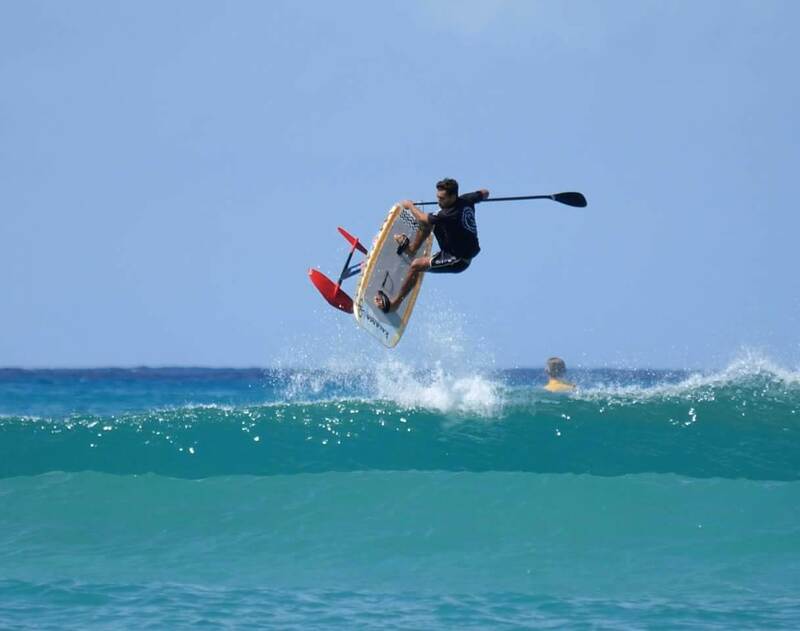 Yeah agree on the smaller wing thing , definite trend here the Kais are getting more and more water time over the IWA & 200's plus seeing a lot more Naish mediums . Guys are now riding better so can get more speed and manoeuvrability out of the smaller wings. Plus you can ride much bigger/steeper waves on smaller wings . I will rarely fly the Kai wing now. And since I have been experimenting with NO Tail wings and hearing about the advantages of smaller tail wings I am NOW convinced that you can take bigger wings into bigger surf. This is the Opposite of what Piros is saying. Aka I will take out my IWA in up to 10 feet before trading down to the KAI (if I even have to then). My dream is to take off early with a big wing, avoid the steep drop, and then have the wing to pump the flats when I run out of wave face. You and Piros may be agreeing. I guess Piros is speaking of steep waves, and you of big waves, but not steep (or at least not on their steep parts). So as a learner should I buy the shorter or new longer mast, as I have a fixed budget and doubt I can get the wife to agree to a upgrade in 6 months, been hard enough to get the foil set over the line first time around. Looking at the the IWA/M200/M280 set for surf and moving into DW which I can get in my budget (just). As a beginner you make mistakes an can damage the gear, plus you will know better after some time what kind of foil you want, and also new, better, and cheaper foils will have come up, and more will be available 2nd hand. Mate just get either the long or the short as they both work and from the sounds you are getting the perfect combo for what you are wanting. Not sure about the 2nd hand option just yet as if its foresale already I would be asking why? lots of crap on the market!! Just get it and get out there you will regret waiting!! It is MORE robust, Stronger, and will give more down the road capability as you learn to turn it apparently doesn't breach as often. Sure you might fly a little higher but you probably will not be able to tell the difference in the beginning. It will all be scary. I tried the long mast the other day and not convinced its a so much better. I like the agile feeling of the shorter one at the moment. Need to give a few more goes. I dont think it be wrong to have either. I was not comfortable splashing out almost 2k on a first foil. I ended up going with the slingshot h4. It has been great to learn on and is super strong. I'll be looking to upgrade soon as I'm just teansitioning to prone. Got no affiliation and agree it's heavy, but in a sup it really doesn't matter that much. I'm sure some with gofoils will argue....but save your money! Wouldn't be replacing that Slingshot Steve just get the new Slingshot 84 front wing for it , even Kai Lenny is riding it . My growing SS wing collection. H5 for high wind wind and kite. heavy gear but holding up well. 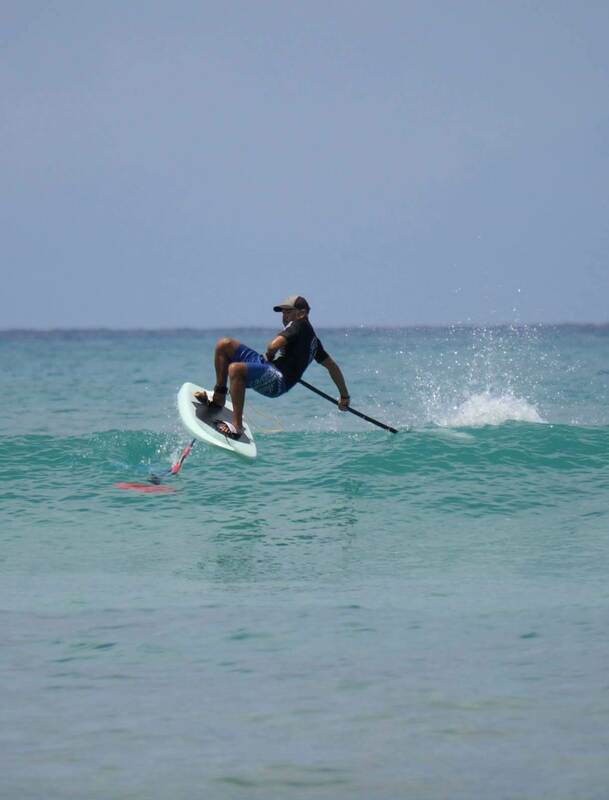 Had a few sup surf sessions on the 84 and it's a super stable at speed. Haven't tried the 76 yet but sure it will be even quicker. 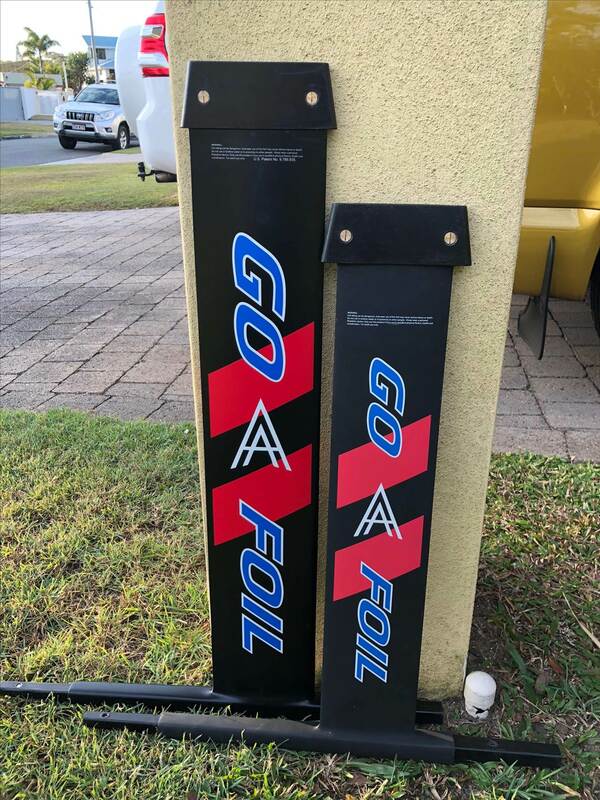 Thanks for the advice, the only 2nd hand available are within 20% of new and at the moment I think there are 3 advertised (any sup foil) in the country, so limited options when you live a small country, so took the plunge last night and handed over the credit card. Now just wait till they ship. No just the 84 and was very impressed by it , the 76 is not really meant for Sup but could be used in big stuff . I'm just transitioning to prone from getting competent with the h4 sup foil. At 78kg I wonder if the 76 or 84 would be better?